Have you ever wondered which part of Europe has the highest annual number of days with thunderstorms? Or wanted to know how thunderstorm activity changes throughout the year? A newly published study in the Journal of Climate entitled A Climatology of Thunderstorms across Europe from a Synthesis of Multiple Data Sources lead authored by Dr. Mateusz Taszarek provides answers to these questions. By combining multiple data sources including human observations of thunderstorms (SYNOP reports), numerical weather model output (ERA-Interim reanalysis), lightning data (EUCLID and ZEUS networks) and severe weather reports (European Severe Weather Database) scientists determined that the highest frequencies can be found predominantly along the Italian peninsula, the eastern shores of the Adriatic Sea, and the southern slopes of the Alps. The plains and hills of Friuli are the hot spot in Europe with more than 50 days with thunder occurring each year. Other regions with more than 35 thunderstorm days are typically in the foothills of mountainous regions, such as the Pyrenees, the Atlas mountains in northern Africa, the Alps through central Europe, and the Carpathians. The annual frequency decreases northward, from 25–35 days over southern Europe to fewer than 10 days over Scandinavia. Peak thunderstorm activity occurs during July and August over northern, eastern, and central Europe. In western and southeastern Europe the highest chances for thunderstorms are in May and June. Although the western Iberian Peninsula and eastern Turkey feature peak thunderstorm activity in April and May, over coastal regions of Spain and Portugal this threat shifts to October (some of these locations actually have bimodal distributions, which is shown later). 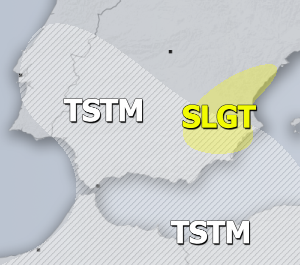 The highest probabilities for thunderstorms over western and the central Mediterranean also occur during October and November, and shift toward December and January over the eastern Mediterranean. Stations in northern Europe (Sundsvall, Goteborg, Helsinki) are characterized by the weakest (severe) thunderstorm activity beginning in May and ending in October. The warm waters of Gulf Stream favor thunderstorms in Stavanger in autumn and winter. In northwestern Europe (London, Schleswig, Paris, De Bilt) the thunderstorm season begins in March or April and ends in November or as late as December. London features less variability in thunderstorm activity during the year compared to more continental stations of Schleswig, Paris, and De Bilt. The mean annual number of thunderstorm days for analyzed stations ranges from 15 to 22 (4 to 8 for severe thunderstorms). In central Europe thunderstorm activity peaks during summertime with a rapid increase in April and a decrease in October. The mean annual number of thunderstorm days for these stations ranges from 27 to 31 (8 to 13 for severe thunderstorm days). In Udine the thunderstorm season lasts until December with a mean of 51 (20 for severe) thunderstorm days per year — the highest in Europe. Over eastern Europe a well-defined peak in thunderstorm activity can be found in summertime with a rapid increase in May and decrease in September/October, typical for a continental climate (Kazan, Kharkov, Moscow). The mean annual number of thunderstorm days for this area ranges from 17 to 29 (4 to 8 for severe thunderstorms). Stations in southeastern Europe share similar features to those in central and eastern Europe. Belgrade, Bucharest, and Sofia have a well-defined peaks in thunderstorm activity in summertime with a rapid increase in April/May and decrease in October. The mean annual number of thunderstorm days for these stations ranges from 32 to 44 (8 to 13 for severe thunderstorm), suggesting that this area has among the highest thunderstorm activity in Europe. Stations in south-central Europe feature thunderstorms occur all year round, driven by the warm waters of the Mediterranean Sea and more frequent convective initiation. The mean annual number of thunderstorm days for these stations ranges from 34 to 37 (10 to 14 for severe thunderstorms), and the annual cycle is generally consistent between the datasets. The peak in thunderstorm activity is observed in the late spring. 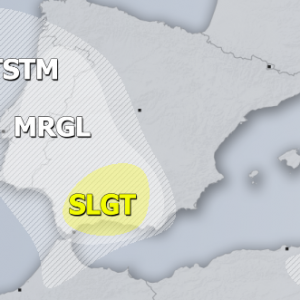 A much greater influence of the Azores high inhibiting summertime thunderstorm activity is evident in Lisbon, Gibraltar, and, to a lesser extent, Madrid. This leads to two peaks in the annual cycle in both spring and autumn. The mean annual number of thunderstorm days for stations in this area ranges from 18 to 24 (5 to 9 for severe thunderstorms). Considering a long-term changes in the thunderstorm frequency over the continent, an increase is taking place over the Alps and central, southeastern, and eastern Europe. Conversely, a small decrease in lightning activity is observed over parts of southwestern, south central, and far southeastern Europe. Similar spatial patterns are observed for severe thunderstorms, although the highest increase is observed over northern Italy and over the Balkan Peninsula. Severe Weather Europe (SWE) team greatly appreciates Dr. Mateusz Taszarek for the valuable article with detailed overview of the study for SWE!